China Report's Digital Introduction to DongSi Mosque (Dongsi Qingzhen Si) of the DongCheng District in Beijing. At Ox Street (Niu Jie) a wide but not very conspicuous main street cutting North-South through the Xuanwu district , we find Ox Street Mosque, the main Temple of the Hui'. The hui are China's most ancient Islamic Minority (others are the Uygurs) and have a status as such. Browse around the interesting Mosque , the main prayer hall is reserved for Muslims only. 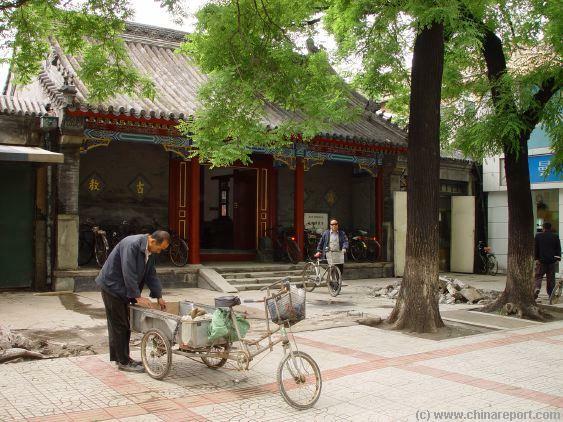 Get the ethnic feeling of the Hui district by walking the hutong streets. The Dong Si Mosque is one of the two most renowned and most visited ancient Mosques in the city of Beijing. Its main counterpart is the Ox Street Mosque situated on Ox Street in the traditionally Hui Muslim part of the Xuanwu District. Where as however, the Ox Street Mosque is a truly functional local peoples Mosque, the Donsgi Mosque of origins is a strictly elite Mosque originally built in order to please and properly host Foreign Diplomats from Islamic Foreign countries. central person on the local community of the Muslims. enjoyed very high religious and social status. Society was divided among Tribal Lines. The Mosque served as the Court House and the Qadi was respectfully called master by the court. Dong Si Mosque and Niu Jie Mosque are two among the 11 remaining historic Mosques in China entire and rank as Number One National Cultural Heritage Sites. Since the Establishment of the Peoples Republic of China in October of 1949 AD, Dong Si Mosque has undergone two major renovations. The first reparations after half a century of poverty and internal unrest in China occured in 1952 AD when all the dilapidated buildings were redecorated. One source mentions how the Dong Si Mosque was protected during the Cultural Revolution Era by Zhou Enlai, who was instrumental in the saving of several Beijing Monuments. In 1974 AD, at the end of the Cultural Revolution Era, a second renovation was done before the re-opening of this important Mosque. Christian Churches in Beijing (such as small DongJiaoMin Xiang Catholic Church) would have to wait considerably longer before being allowed to re-open their doors. 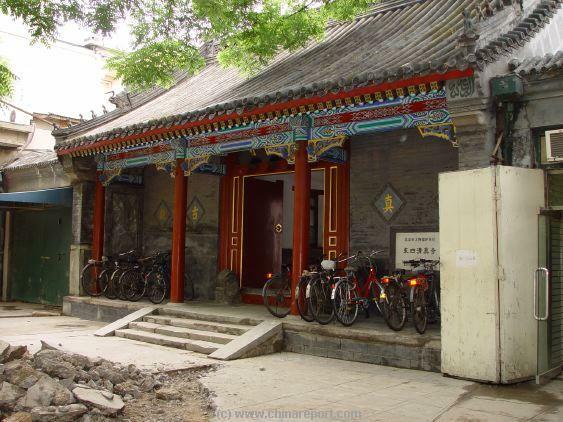 According to the book "Off the Beaten Path in Beijing" the Dong Si Mosque was regularly visited by foreign tourists in 1993 AD, however there were no less than 6 resident Imams available at the Time. As is commonly seen in Chinese Mosques, the whole complex seems to be camouflaged and presented as a Chinese Temple Complex. The Exterior Gate, freshly repainted in 2005, boasts Chinese Language Sings only. On closer inspection inside however, the interior structures of the mosque complex do combine Chinese and Arabic styles in a subtle way. In this way Dong Si Mosque is similar to the Niu Jie Mosque. Equally, Dong Si Mosque has its very own Star Gazing Tower which however is not easily noticed due to the fact that Dong Si Mosque has its Gate facing the East, while Niu Jie Mosque has its Main Gate facing the West and the City of Mekka. To view the Star Gazing Tower be polite and ask the Warden. If situations allow, you can be allowed to enter and have a small and quick tour of the Mosque. Although seemingly small on the exterior Dong Si Mosque covers no less than 10.000 square meters and has two courtyards. Wit this, before renovations of the Niu Jie Mosque, it was the largest Mosque in Beijing since its opening in 1356 AD (Liao Dynasty). Construction works ongoing in front of the freshly repainted Main Gate of Dong Si Mosque in May of 2005 AD. The Dong Si Mosque is located not too far from the Wanfujing Main Shopping Street. 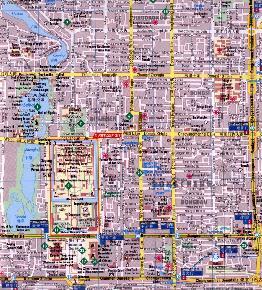 In Fact, it lies on the street that runs paralel to Wanfujing Street but lies one block to the East. That being said, what with the size of the city blocks in Beijing, this still makes for quite a hefty walk. Fortunately, with the selection of Beijing as host of the 2008 Olympics the Beijing Subway Metro system has been substiantially improved, since also including a subway station at Dong Si Mosque itself. Although the route walking from Wanfujing remains interesting, it is now possible to travel directly to Dong Si Mosque and the somewhat hidden Dragon Happiness Temple Street min shopping zone across the road on the north side. 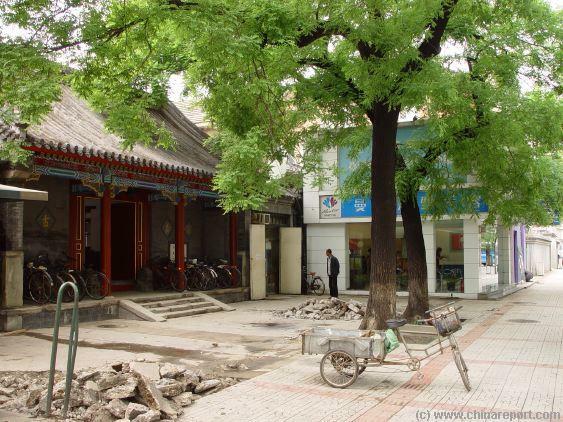 After walking from South to North through the Wanfujing shopping zone, turn of to the right (East) into Jinyu Hutong. After reaching the next intersection, where the CITS Headquarters is located, turn left and North into Dong Si South Street. Can not miss now although it is still quite a walk up to the Mosque itself. DongSi's modest main 'Gate stands along the Northern End of Dong Si Nan Dajie' just a few steps from the intersection with ChaoyangMen Dajie. The Dong Si Mosque was first built in the Year 1356 AD, which was under the rule of the Mongol Kublai's of the Yuan Dynasty. It was the very same year that the the Mongolian Overlordship in China (the Kathay Khanate) started to show crackling as Zhu Yuanzhang, one of the leaders in the Red Turban Rebellion, captured the city of Nanjing from the Mongol-led Yuan Dynasty in China starting a mutiny that is to sweep across the Nation expressing a strong bout of anti-Mongolian sentiments. 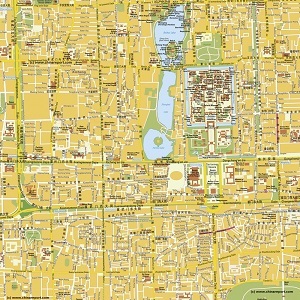 As the city of Nanjing became the base of power for what would become the Ming Dynasty (1368 AD - 1644 AD) of China the first capital city of that new dynasty, Mongolian influence over the Han Chinese Territories started a rapid decline. In the aftermath of what had been a carefully executed and unbelievably ambitious plan that brought China to be at the center of the (Eastern) world, the Dong Si Mosque was reconstructed in the year 1447 AD under the Zhengtong Emperor ZhengTong (Reign:1436 AD - 1449 AD ) of the Ming Dynasty (1368 AD-1644 AD). The Yongle Emperor had passed away in 1424 AD, after which two Emperors had already followed. With the Nui Jie' or Ox Street Mosque the number one Mosque in Beijing since the year 996 AD and the Tenth Century, Dong Si Mosque, located in the prosperous Dong Cheng District of the City would become the Second Ranked Mosque in Beijing. Due to its proximity to the Imperial Palace and location inside the Imperial City Walls was used to house Members of Tributary Missions send from the Muslim Lands in the West and South-East Asia. Fresh Paint, Colorful Decorations versus Piles of Rubble and the neighbors old refrigerator. Dong Si is a well-merged part of Local Hutong and Folklore. The Interior Courtyard of Dong Si Mosque and the hidden star gazing tower in the back of the Mosque. For the time being the Christians were allowed to station themselves just within the Gate and Walls, a more privileged position yet still as far away from the Emperor and his Courtiers as could be under the given circumstances. There, on the fringes of the real City, the Imperial City, the foreigners had little influence and few options to mingle in the affairs of the more powerful and influential Chinese, who resided within the safety of the City Walls. Although as guests they received stipends from the Government, atogether they were being kept at arms length, so to speak. Mouse over Image - Approach the Front Gate of Dong Si Mosque (Photo May 2005). Although Dong Si is first and Foremost a Historic Mosque, it also functions as the Seat of the Headquarters of the Beijing branch of China Islamism Association. Main Imam is Mister Imam Dawud Shi Kunbin. Visiting Imams may lead in Prayers and there is a historic theological Library available on site. Not Five but Three services are held Daily. The First is early at dawn, then mid-day at 1pm and in the afternoon at 4pm. On average 500 to 600 worshippers attend Friday prayers at Niu Jie, the largest of the 40 mosques that serve Beijing's (Peking) 180,000-strong Muslim community. 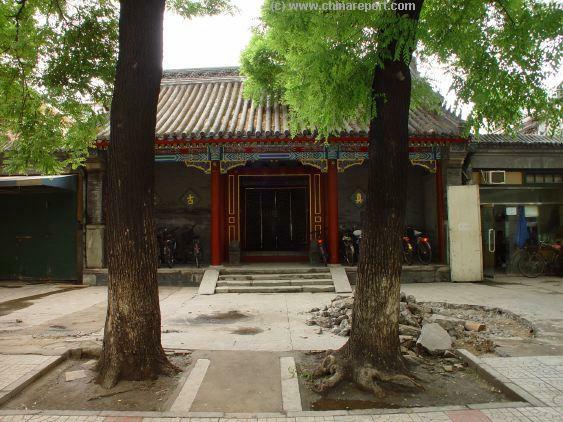 The Three Old Mosques in the Old City of Beijing are first and foremost - Ox Street (Niu Jie' Mosque), part of the Ethnic Minority Village named LiuHe in Xuanwu District lying originally outside the City Walls. 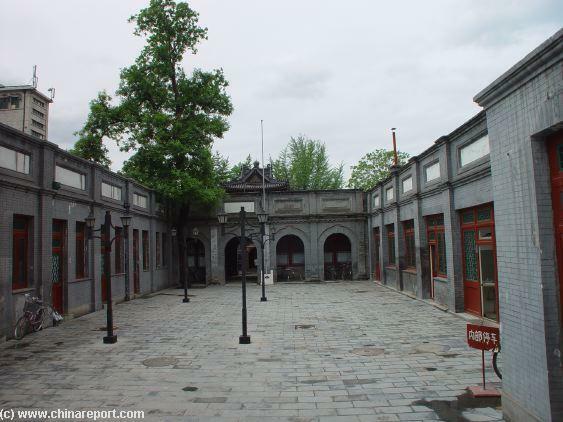 Secondly, the Dong Si Mosque of the 15Th Century, and Thirdly the West Flower Market Street Mosque (Huashi) of 1415 AD, located outside in the (now demolished) Uygur Islamic Hutong of the (former) Chongwen Gate in Chongwen District. not notice the front gate and building at all. The Dongsi Mosque is however the largest Mosque in Beijing. Resembling a Chinese neighborhood Temple, today's Dong Si Mosque stands along the southern section of the street baring the same name, the Dong Si Nan(=South) Dajie'. In the Time of the Empire, the nearby Dong Si Gates were the Eastern Gates and Entrance into the secluded Imperial City, reserved for the Cities Elite. Today, the Dongsi Gates have disappeared, and in the last few years Dong Si Nan Dajie has been slowly transforming into a fashionable and popular shopping zone with a Music Store, several hair-dressers and plenty of girlie clothing stores. Further down the street from the Mosque is also an interesting bookstore. After your visit head north and walk across the wide Dongsi West Boulevard to reach the Dragon Hapiness Temple Street situated out of sight just across that road. Some of it side-streets still hold remains of some original and still interesting hutong, while the street itself holds some good and unusual stores (outlets); dvd's, music and hiking gear for men and all kinds of clothing, accessories and shoes for the girls. To the south and down the road from Dong Si along Dong Si south road one can find a variety of little shops, seemingly always changing in variety, with a few good mainstays. Among them a rare music store, an antique books store and plenty boutiques for the ladies to browse. Altogether, the Dongsi stands in a busy but cozy and lively neighborhood. Musical Bonus : A Classical Folk Song from Xinjiang Province on Bamboo Flute and Bowed String. For more information on Islam, Muslim's and Muslim Ethnic Minorities in China please refer to the adjacent Map of the Distribution of the Islamic Faith (Europe, Africa, Asia + China) with a simplified view of Demographics and lenghty explanation or find our Culture Section and included Page on the History of Islam and Islamic Culture in China. 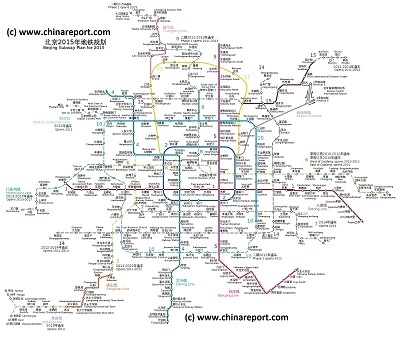 Full Map of the Beijing Subway System of 2015 AD, New Dong Si Station - Click Map for FULL Version ! According to our sources the mosque's library, known as the Repository Hall, houses valuable historic copies of manuscripts of the Koran, the Hadith, Islamic law and other works of Islamic philosophy. The Repository Hall is located behind the main prayer hall, and is a beamless all wooden building decorated with motifs in bright and flaming colors. Its architecture, as with the other historic parts of the Mosque, is of the Ming Dynasty Style. On the surface of the dome-shaped roof the words of the Koran are engraved in Kufic script, the form of Arabic calligraphy reserved for religious and official purposes. Among the Treasures is a copy of a Yuan Dynasty Era (1271 AD - 1368 AD) Copy of the Holy Quran. The Library further Houses historic works and literature published in far away lands such as Egypt, India, Turkey and Pakistan. All Islamic influences carried on the Silk Road and through the wide trading and cultural contacts of previous dynasties, such as the Han (206 BC - 220 AD), The Sui (581 AD - 618 AD), The Tang (618 AD - 907 AD) and the Yuan (1271 AD - 1368 AD), the latter of whom at one time held the largest Empire in World History. The Second Courtyard of the Mosque holds the original Stele commemorating the Reconstruction of the Mosque into the Largest One of the City in 1447 AD. The Stele is inscribed in both Chinese and Arabic Language, in that order. Last but not least the Mosque still treasures the now broken remnants of the original bronze cast top of the Minaret that was added to the reconstructed Mosque in 1468 AD and was the only Minaret to stand in Beijing. The Minaret stood at Dong Si for 440 years until it finally fell down in disrepair in the year 1908 AD. Today's remnants still display the text "cast in 1468 AD". Christianity were respected and had their place within society as well as the larger Government system regulating religions and rites. Most importantly, the Original Temple was built with the finances donated by an Influential Muslim General of the Yuan Era, named Chen You-Ding (also: Chen You). The Yuan Dynasty Era (1271 AD - 1368 AD) was an especially prosperous era for Islam in Chinese History for various reasons. In the first place, during the conquest of Asia by the Mongolians, the central Asian nations had come first in the long row of victims. Hence, when new armies were created to take up the fight with the Chinese Empire (at the time divided into the Northern Jin and the Southern Song) and later administer new territories, Islamic Nobles from the conquered tribes and nations of central Asia were among the first to rise to the occasion. As loyal allies in these battles, Muslims gained a high social status in the society that appeared after the wars subsided. In Yuan Dynasty China Muslims ranked number 2 in social status, only surpassed in class by the ruling Mongols. Other important factors contributing to the success of Islam in this period are the falling away of 'international borders' as the Eurasian continent was United in one huge Empire, the largest in world history. As a result traders could roam 'free' and what happened next was no less than a watershed in history. Many groups of Muslim migrants who had beforehand lived in Central Asia almost freely moved into Xinjiang, West and South Gansu, parts of Qinghai Province, Ningxia, Inner-Mongolia and Shaanxi Province. In the South along the coast trade with Persia and the Middle East was unprecendented, the largest ports of Huangzhou the flourishing trade city of Zhejiang and Quanzhou in Fujian seeing contact with no less than 70 foreign overseas nations, among whom most Islamic. Not only were Huangzhou and Quanzhou huge cities with large numbers of visiting and immigrated foreigners, many of them were Islamic and lived together in large Muslim Villages and suburbs. Although the Huihui (as they were then named and later redubbed) gained enormously in status, wealth and access, certainly not all was peace and harmony within the large Empire. During the 14Th Century, when the Yuan Dynasty was already faltering in China it came to a rebellion of Muslim Enclaves in and around the harbor town of Quanzhou, which is exactly where the story of General Chen You and the construction of Dong Si Mosque comes in. To understand the proper historic significance of the Dong Si Mosque we must go into the history of Quanzhou in Fujian Province. In the third quarter of the 14th century the Muslims in Quanzhou organized an army of several thousand men, which joined with other local troops in rebellion against Yuan forces in Fuzhou, the current Capital of Fujian Province. The rebellion was a powerful one and lasted from 1357 AD to 1366 AD, with a devastating effect on international trade with Foreign islamic Nations. In the end, eventhough the Yuan Dynasty (1271 AD - 1368 AD) was in its last throws, the Muslim rebels of Quanzhou were defeated by the Yuan general Chen You-ding, and as surviving Chinese Documents from the Era report most of the Muslim 'troops' (translated from Persian: espāh) were killed, the usual penalty for standing up in open rebellion to the Imperial Throne. A Schematic Map of the Eurasian Trade Routes existing in the 13Th Century. Clearly marked in Red Accent on the Map are the cities of the network of land-bound trading routes through Central Asia known as the Silk Road (the path of Marco Polo and others). Marked in Blue Accent are the Main Ports and Harbors of the Maritime Trade Routes that operated between the Arabian Peninsula and the Red Sea, the Indian Ocean and Coastal Cities, the Straights of Malacca, the South-China Sea's and beyond. As shown, Maritime Trade to China mainly entered through Southern Harbors, then was distributed internally by use of the Grand Canal, the Yangste River and the Yellow River. 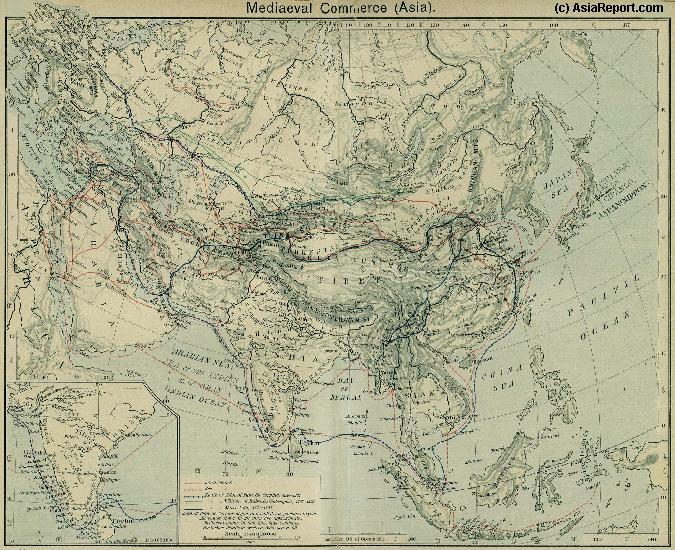 Map includes the Route traveled by Marco Polo, William of Rubruck and John of Pian de Carpine, the three famed European Travelers of the Time. To complete the background story on the Dong Si Mosque, the Chinese Maritime Missions ordered by Ming Emperor Zhu Di (Yongle) were completely succesful and brought unprecendented contacts with other nations, many more than the 70 that China previously had found itself in contact with. In Quanzhou, the largest town, things were also moving back to normal. That is, the first Muslim family to return to the city after the political situation had improved was the Xia family, descended from Borhān-al-Dīn Kāzerūnī; (since then the position of imam at the Masjed al-Aṣḥāb has been passed down through this family or clan line). In their wake, other clans such as the Ding family, now consisting of more than 10,000 members living in the township of Chen-dai, followed, all to settle in villages surrounding the center of Quanzhou. As the world knows today, the Chinese Emperor chose instead to equip the largest Navy in the world, and sent them out across the 70 or more nations that had previously been in contact with the Chinese Empire. These Maritime Missions, so far the largest in Chinese Naval history, were entirely intended as goodwill missions, establishing contacts, bringing friendly relations and in one word: impressing the Foreign populace and better, their rulers. Not only did the fleets sail for the reasons of trade, they did far more. To play the main role in the Grand Chinese plan to impress the world, and once again establish the Chinese Culture as the dominant and most prestigious in the region, the Yongle Emperor chose a Chinese Muslim to be the Admiral and Commander in Chief of no less than five seperate fleets (estimated at 2 to 300 or more ships per fleet). This was Admiral Zheng He, who subsequently led the great Chinese western fleet that left Fujian in the year 1403 AD with the aim of reestablishing diplomatic contact and trade with the Western Regions. It was through the actions of Zheng He (and the fleets) that relations with overseas nations blossomed once more and in particular it was Zheng He who was instrumental in the resuming of trade between Persia and the City of Quanzhou. Among things, Zheng He first recruited Muslim navigators and interpreters in the city of Quanzhou, who were then taken on voyages to their Nations of origin. Zheng He himself being a Muslim, and of tall stature, left a incredible impression of civilization, wisdom, knowledge and Chinese power on the Nations he visited. The five fleets under the High Command of Zheng He sailed to Southeast Asia and the Indian ocean seven times in the period 1403 AD - 1435 AD. On the fourth, fifth, sixth, and seventh voyages (1414 AD - 31 AD) it reached Hormoz while at the same time some missions from Hormoz visited China. A stone inscription found in the sacred tombs of Ling-shan (Miracle hill) in the eastern suburbs of Quanzhou attests that Zheng He made a pilgrimage there in 1417 AD, before his fifth voyage west. Thus, general Chen You-Ding had saved the Nation from one disaster, however the brutal and systematic massacre of the defeated Muslims landed the Chinese in another one of bigger proportions. All in all, the event of the Rebellion had had a negative impact on Quanzhou's trading economy already, and the massacre of Muslims in China's most important trading city had even larger, international repercussions. Suddenly, the China of the Yuan Dynasty was seen as less friendly for Muslim people, and also as a result of the death of the traders and their families immediately exchanges between the Middle East and China decreased. The Muslims who escaped the punishments of Imperial Armies in the aftermath of this 'espāh' rebellion fled away to remote places and discontinued their trade. 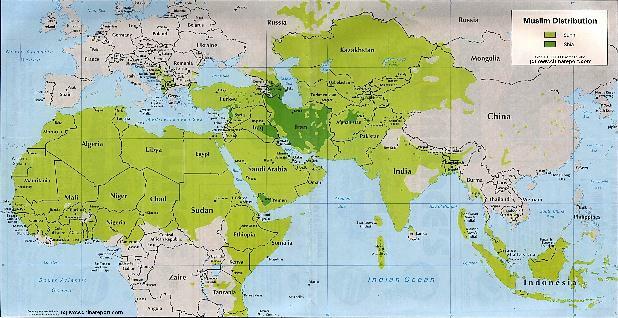 Muslim Nations in Persia and the Middle East although far away frowned upon the actions of the Yuan Court and Military. This is where, the establishment of the Dong Si Mosque becomes important. In essence, the Dong Si Mosque was built in Beijing, not far from the Imperial Palace, as a gesture of friendship and willingness on behalf of the Yuan Court. In essence, by having the very General who pacified the Rebellion donating the construction cost for the largest Mosque in Beijing, which was intended to house Islamic Foreign Diplomats on their visits to the Beijng Court, the Yuan Dynasty Emperor was showing his willingness to make amends. The hope was that the Muslims would be willing to overlook the earlier conflict and bloody suppression and resume their trade and friendship with the Empire. The Mongolian Rulers of China needed and wanted trade with Persia and the middle-east. It was badly needed to stabilize the Empire. Thus, it can be concluded that the construction of the Mosque was mainly intended as an open diplomatic gesture, inviting Muslim Nations to once more engage and be friends and partners with Yuan Dynasty. It was as if the Mongol Rulers of China (Cathay) were saying, look; an open rebellion we cannot tolerate, but otherwise we are very tolerant and friendly towards your religion and culture. Lets start afresh. looked upon as much more promising partners. Furthermore, the Ming Dynasty had arisen from rebellion in the South, which was where the main trading cities were situated. The Arabs and Persians had no problem with the riches their trade with China brough them, and now that the Mongolians had been eliminated and thus punished, things could be brought back to normal. Even then, possibly due to civil war in China during the Dynasty change, it was not until the reign of the third Emperor of the Ming Dynasty, the now infamous Zhu Di (Reign: 1402 AD - 1424 AD, Reign title Yongle) that trade would be fully revived. In fact, during the Yongle Reign (Zhu Di) Chinese international trade reached an unprecendented level which would not be seen for centuries after. The Ming Emperor Zhu Di, basicly started off where the Yuan Dynasty had ended, with an open invitation to the Muslims to do more trade. However, far from merely inviting the Muslims back by building a Mosque for their Ambassadors, Zhu Di launched a far greater and much more ambitious scheme to rewin the respect of the Muslims. He would not only win their respect, he would put them all at awe. That was Zhu Di's way. just 50 meters away from the intersection with large East-West traffic artery ChaoYangmen Dajie'. The Mosque is wedged between various modern buildings and the rest of DongSi Nan Dajie' continues with rows of small but modernized shops. Look well and you will find it no doubt ! received preference for his scientific achievements and willingness to serve the Chinese interests and adapt to a Chinese line of thought, at the Court he met plenty of opposition.